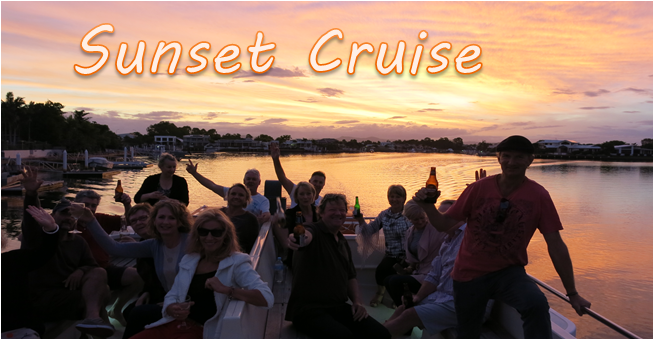 Cruise departs 40 min before sunset to catch that golden glow across the water as it sets amongst the Glasshouse Mountains - while you relax with your BYO drinks and nibbles. Glassware and ice provided. NEW - Yes - you can join this cruise at Pelican Waters - 45 minutes earlier than the advertised Tripcony Lane departure time. Note that you will be on the boat quite a bit longer than the regular 1.5 hour cruise - You will be onboard for the transit up to Caloundra and return at the end. $30 all adults. If in doubt, call. 1. Wheelchairs may not board this cruise. Wheelchair Access at Pelican Waters Jetty only. 2. We are not signed up to the disability Companion Card program but we do provide facilities and services to allow those with disabilities to enjoy the marine park via our cruises where possible. We do offer a small discount to the person accompanying a Companion Card holder to acknowledge the circumstances.